International karateka Babyana Gurung from Sikkim is once again all set to represent the country in the upcoming Thailand Open Karate Championship 2018 to be held from July 18 to 22 at Bangkok in Thailand. She is a part of 25-member India team to the championship. This is her second appearance in the international championship. She has recently won a gold medal inKataand silver medal inKumitefor the country in her debut international participation in the 4th International Karate Championship held from June 9 and 10 at Thimphu, Bhutan. 16 years old Babyana is 1st Dan Black Belt karateka from Gangtok and is a bio science student in class XI of Holy Cross School at Tadong. She is the daughter of international karateka and kick-boxer Bijoy Gurung and national karatekas Bimala Gurung. She has been qualified in the national team for this championship on the basis of her outstanding performance in the national championship held in January earlier this year at Kolkata. She has also been qualified in the prestigious National Games 2019 to be held in Goa. 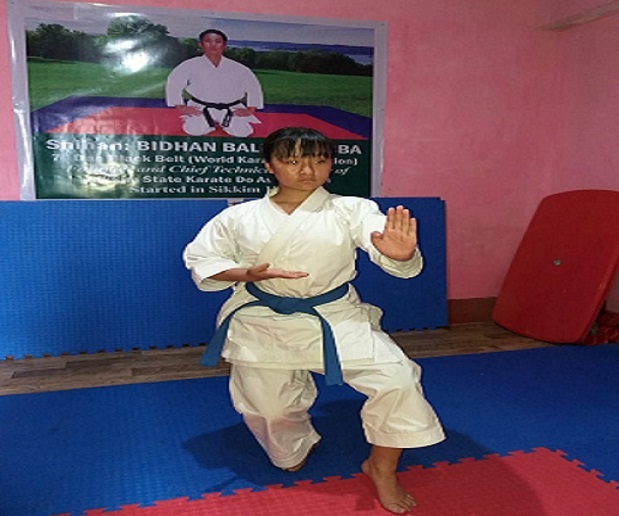 Babyana has been undergoing rigorous 6 hours training session every day under the experienced chief coach and technical director of Sikkim State Karate-do Association (SSKDA) Bidhan Ballav Subba and other coaches. Speaking to media persons Babyana expressed her confidence to win gold medals for the country in the championship. “Although the competition would be very tough as it would have the best karatekas from different countries. I have been preparing very hard under my coach with the target to win gold medal for my country again,” she said. She further added that medals in her debut international participation in Bhutan have highly motivated her to give the best to win medal consistently for the country. SSKDA chief coach Subba said Babyana is a hardworking and dedicated martial art player and has full potential to do better in the international platforms. “We have the high hope that she will again make the country proud with her performance. We have also been preparing her and other karatekas of Sikkim with the target to make them qualify in the upcoming Olympic Games,” he said. Likewise, Babyana’s father, Bijoy Gurung also said his daughter is in a good form to win gold medal for the country in the championship.